Will help you appreciate and understand the significance of Isaac Newton's masterpiece--what many regard as the greatest scientific contribution of all time. Despite its dazzling reputation, Isaac Newton's Philosophiae Naturalis Principia Mathematica, or simply the Principia, remains a mystery for many people. Few of even the most intellectually curious readers, including professional scientists and mathematicians, have actually looked in the Principia or appreciated its contents. Mathematician Colin Pask seeks to remedy this deficit with this accessible guided tour through Newton's masterpiece. Using the final edition of the Principia, Pask clearly demonstrates how it sets out Newton's (and now our) approach to science, how the framework of classical mechanics is established, how terrestrial phenomena like the tides and projectile motion are explained, and how we can understand the dynamics of the solar system and the paths of comets. 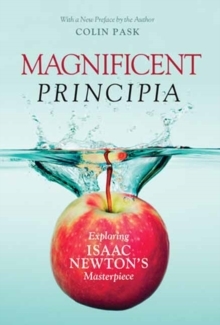 He also includes scene-setting chapters about Newton himself and scientific developments in his time, as well as chapters about the reception and influence of the Principia up to the present day. Now in paperback with a new preface, this lucidly written work makes Newton's landmark achievement comprehensible to lay readers.